The call from Graham's school came on Monday, barely an hour after I had settled into a busy day at work. "We have Graham here in the office," said the voice at the other end of the phone. "He's not feeling very well and I think you'll have to come and get him." "I don't think it's serious," was the reply. "Here, I'll let you talk to him." There was a shuffling noise and then, Graham's voice, so thin and tiny that I instantly felt my chest ache as my heart swelled and pushed against it. "I throwed up in the trash can Mommy. Are you going to come and get me?" I went and got him. I took him home and tried to catch up on work e-mails while he lolled on the couch and watched cartoons. I fed him chicken noodle soup and buttered sourdough toast and anxiously inquired about his well-being. He appeared to be perfectly fine. He appeared better then fine, actually: he appeared buoyant and, in retrospect, perhaps just a little relieved. That evening I even took him to the park and let him run off an obvious surfeit of energy. 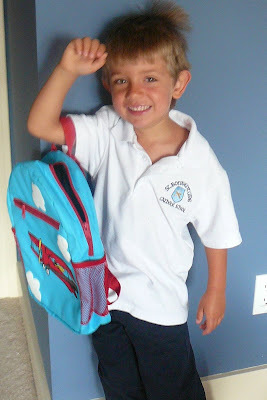 Yesterday morning I walked him into his classroom where we were greeted by his teacher. "Graham seemed fine at home yesterday," I told her. "Well I think it was probably just nerves, but he looks way better today than he has since he started," she said. "I mean, he's just seemed so anxious." I decided not to make a big deal of it: when I spoke to Graham after school yesterday he was happy as a clam and assured me he had a "great" day. I decided not to say anything about it at all. And then this morning, as I buckled him into his car seat, a look of pure panic flashed across his dear, wee face. "I'm gonna be sick Mommy, I'm gonna be sick," he wailed. "I need a sick bowl." I handed him the car's waste paper basket and stood there for quite a while, rubbing his back and trying to reassure him. "It's okay. It's normal. Everybody feels a little nervous sometimes. Even Mommy when she goes to work. All the other kids at school probably feel a little nervous too". After a few minutes he seemed okay and off we went. I walked him into his classroom again where the morning story was already in progress and apologized for our lateness. "Graham had a little attack of nerves," I whispered to the teacher, as discreetly as possible. "Yes, that happened yesterday as well." 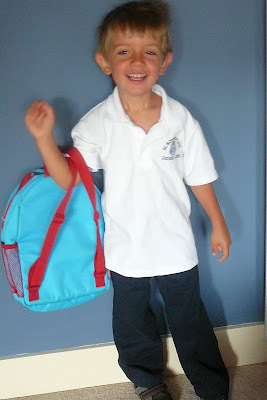 And so it seems that perhaps my darling boy is not quite as confident as he seems or as I so proudly asserted he was following his first day of school last week. And so it seems that I must come to grips with the painful realization that the child I thought I knew better than my own heart has anxieties and fears that, for whatever reason, he feels he must keep hidden from me. By all accounts today is significant, but it is especially so for me. I celebrated with my family already last weekend and I enjoyed tons of well wishes and cake at work today, but despite all the exhortations from female friends who've already hit this milestone, I don't feel liberated. I have instead been unable to shake the melancholy that has plagued me since waking: it is nearly bedtime and I still feel unsettled. I am happy enough, but not knowing if my family is complete leaves me unable to exhale and ill-equipped to make grand declarations about what the next year or the next decade will bring. I cannot help remembering that last year I was so rushed on my birthday that I completely forget it until my sweet mother-in-law forced me to slow down for a birthday kiss: little did I know it would be the last one I would ever receive from her. So what if I never expected my life would look like this at 40 - that's hardly surprising is it? Just last weekend, between bites of an early birthday cake, my father quoted me an old saying that has rung in my ears all day today: "The secret to being happy in life is not getting what you want, but being happy with what you get." And in the absence of grand declarations, that, I think, will be my mantra for the coming year and hopefully for all those that follow it. As much as I deep down might entertain the notion that I am somehow different and perhaps even a little special, I was today humbled to learn that I am but a walking cliche. That is to say, oh yeah, I cried. Graham didn't, but I did. He was a little nervous, but not overly so. He needed only some gentle reassurance and a great big hug before confidently taking his teacher's hand and allowing himself to be lead right out of his babyhood without so much as a backwards glance. And I lingered, at the classroom door's edge, uncertain and teary, straining to keep him in my line of sight as he settled into a circle of his peers at the front of the room. The teacher nodded, a kindly cue for me to take my leave and even as I cursed myself for being that mom, the tears started to spill. There's a reason why cliches become cliches and it was more emotional than I ever imagined it would be to know, at that moment, that the person I would die to protect was beginning his journey into a world where the sum total of the affections of a hundred friendly faces he encounters won't equal a millionth of the passion his mother has for his well-being. So I cried, just a little, and I wished with all my heart that his Oma could have seen him today, so handsome, so grown up and so confident. So yeah, I am a walking cliche and I cried, because even though Graham returned home today, looking exactly the same as he did this morning, I already miss the boy he was when he left. There are two ways of looking at the photos below: a selection of shots I took yesterday at the closing day of the Canadian National Exhibition (CNE) in downtown Toronto. If you just glance at the photos you will likely take in a scene that looks very similar to scenes I often present here, in pictures and in words: scenes of a carefree and charmed childhood enjoyed by a boy with two parents who, whatever their struggles, endeavor to create happy memories that will one day act as a bulwark against the complications and difficulties that adulthood inevitably brings. Looks like a great day, right? Yesterday was a terrible day. 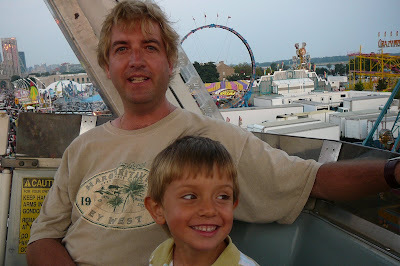 Yesterday was a terrible day not because the CNE was hot and crowded and ludicrously expensive, though it was all of those things, but because it caused both Rob and I (though really mostly me) to question whether all the effort we put into creating memories with Graham is actually having the desired effect. Let me be blunt: Graham wasn't just poorly behaved yesterday, he was insolent and just plain bratty. Look a little closer at the photos. Can you see the frustration and the exhaustion on our faces now? We were exhausted - by almost constant, enduring temper tantrums that erupted over the most insignificant things the instant Graham's gratification was denied or delayed. 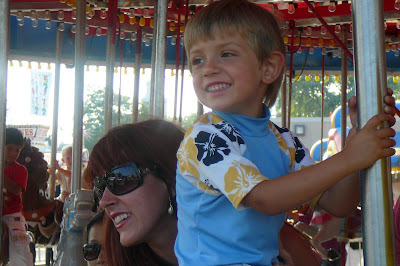 We all know that keeping a three-and-a-half-year-old in line anywhere there are crowds and candy and rides and noise is bound to involve some major headaches, but normally the fleeting moments of joy and fun make it all worthwhile in the end. I have never spent so much time correcting behaviour: talking, discussing, sternly warning and yes, yelling. I have never felt tears of frustration sting my eyes so many times in such a short time frame. The pain involved in yesterday's outing so far outweighed the pleasure that even a full 24 hours later, I still wish I had not bothered to go at all. Graham's Labour Day weekend was a whirlwind. He celebrated his uncle's birthday with a big family dinner that went late on Thursday. On Friday we headed for the lake and spent Saturday and Sunday at Grandpa and Grandma's where Graham collected clams and played in the water with his cousins. He had a campfire and a sing-a-long and boat rides and barbecues. 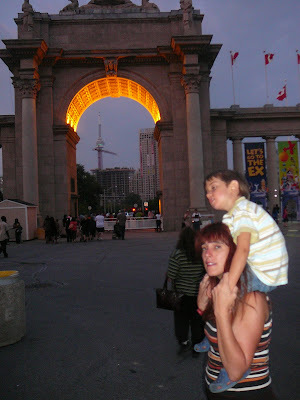 We came back to the city Sunday night for the express purpose of taking him to the CNE on Monday, our seventh wedding anniversary. Maybe. Rob thinks so. 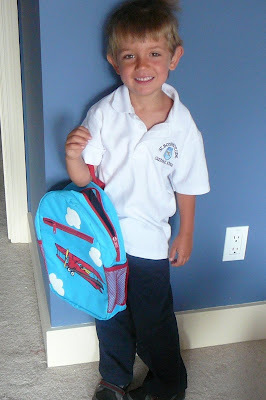 He also thinks he was way overtired (true) and nervous about his first day of school on Thursday (possibly). He doesn't really think that Graham's behaviour, however awful, is completely out of the norm or that it indicates a problem with discipline or entitlement. He thinks I was right to be so hard on him, but that I should stop being so hard on myself. 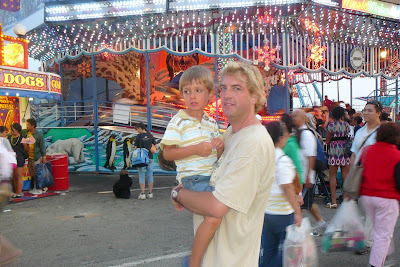 Because I can't shake this nagging fear that my well-meaning attempts to make my son's childhood special have unwittingly contributed to the creation of a spoiled, entitled little monster. Many, many moons ago, before Graham developed his fixation on a certain comely neighborhood girl, he had another obsession. And this obsession. I think, may well outlast his affection for any girl he has met or has yet to meet. This obsession, after all, has persevered since the very beginning of his short life; from the very first time he started to become capable of making his wants and desires known. He has been since birth and still is, as evidenced by the picture below taken at the birthday party for the daughter of a dear bloggy friend last weekend. Yes, during a birthday party featuring wonderful food, tons of kids and a magic show with doves, a rabbit and an iguana, my boy spent most the time fixated on his first, true love. 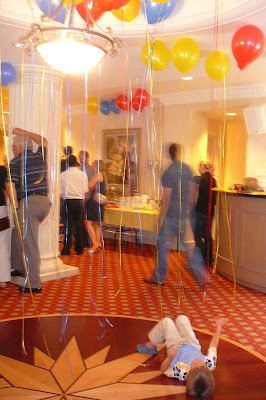 Oh well, odds are balloons will never throw him over for the captain of the football team, right?